As some of you know, I’ve been REALLY getting into new fiction, getting to know independent writers (and forgive me if I am incorrect in calling them Indie Writers, as I’m still pretty new to this game). Without further ado, I would like to introduce you to Shaunna Rodriguez. I found Shaunna via a re-tweet on Twitter a few weeks ago. She’d put out a short piece on Amazon called The Roommate Crisis, and I’m not sure what I was expecting (probably fiction, since I’ve always been a fan of that, ha ha), but this seemed to be a piece of non-fiction, but I really enjoyed it. As we visited back and forth, I came up with the idea to interview new, independent authors, and I asked Shaunna if she would be kind enough to be my first. Shaunna, how long have you been writing? I actually wrote my first story when I was four. Typical child’s play. However, when I was ten years old, I wrote my first book. This was not child-like; it was a mystery with hints of love and attraction. It was about a young couple that had a whirlwind romance. He was a tennis player, she was an agent and their relationship was forbidden. What she didn’t know was that he was actually an undercover agent who had been put on detail to protect her at all costs. She had no idea she had even become the target of an obsessed fan and psychotic killer. It was after I wrote this that my mom took me to see a child psychologist. He confirmed that I was an advanced child who excelled in every aspect of creativity and academics and that writing and imagination were my strongest abilities and to expect great things from me and not to restrict my writings or imagination. Have you always wanted to write?Yes. If you eat,sleep,dream and think writing you’re meant to be a writer. I can have a full blown conversation with you, watch a movie, edit a book, talk on the phone all while mentally constructing a new book. What genre really inspires you? This is actually a tricky question to answer as I write in every genre. I have zero restrictions on my writing. It’s whatever mood that strikes me. If something dramatic happens such as a woman who is encroaching on my personal space and verbally attacking me, shes the next victim in my book. It’s not illegal to murder someone in a book. That’s the beauty of writing. I was actually inspires to write Country Heels during my first marriage. My writing allows me to express myself creatively and to fill in the missing gaps in my life. In this case it was romance and a man who would swim shark infested waters for me, who hung the moon and I was his everything. I created that book base on what was missing in my life and the desire for romance. I find inspiration in the most unique of things. Do you remember some of the authors/book titles you read as a child? Absolutely! Nancy Drew was my favorite. I couldn’t wait to go to the library and check out as many as I could. The Berenstein Bears, Cinderella, The Box Car Children and Mary Higgins Clark, Daddy’s Little Girl. It was after reading her book I wrote my first one. I wanted to be just like her. I remembered how I had felt reading her story and I wanted mine to make others feel that same way. Of course the Babysitters Club. I can assure you that had Harry Potter been around when I was a kid, it would have been my favorite series. Does anyone in your life encourage you to write your heart out? I’m undecided on how to answer this question as its a bit complicated. Yes, my mother has always supported my writing and has saved every award I’ve ever received both as a child and adult. Recognition for my books from Who’s Who and several other notables. The hard one to answer is again, yes, but no when it comes to my husband, Eric. He tells me to “write what you want, with restrictions.” meaning it’s in his best interest if I refrain from writing about his ex-wife or anything to do with that aspect of his life, despite how it’s affected me or how it’s impacted my life including writing fictional books that his ex-wife is convinced are written about her, which could not be further from the truth. What advice would you have for a newbie writer that wants to break into the world of fiction/non-fiction? Welcome to the world of writing. Prepare yourself for this fast paced, unsympathetic world. Do not ever give up. No is never the end, it’s only the beginning for better and more possibilities that will show the world your talents. Never stop writing and never let an idea pass you by. If you see something and you think that’d make a great book! Write down a note right then because later you are sure to forget and it could have been your best seller. Accept now that not everyone is going to love what you write. Prepare yourself for controversy, opinions and ideas from others but never give up faith. All it takes is for one right person to love whAt you’ve written to bring your work into the light for others to enjoy. Write for passion, for fun and for yourself. When you are satisfied, then share it with the world. To date, what is YOUR favorite story that you have written? Right now, I have 2. 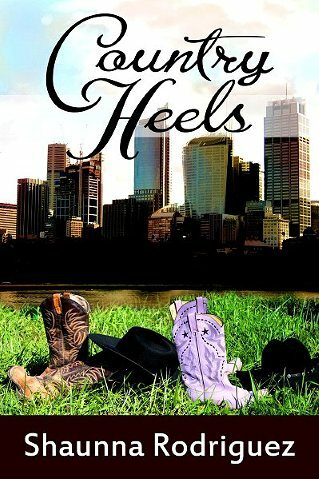 Country Heels, my new romance novel and my yet to be revealed Steal Me Into Moonlight. It’s a vampire romance novel full of everything. My life is tied to my books. They’re what I always have when nothing else is certain in life. Who/what gets your creative blood pumping? Well that depends lol. Lately His ex-wife but usually just a passion for writing in itself. If you were’t writing, what would you be doing? Honestly, I’d have lost my mind a long time ago if I didn’t have my writing. I have always balanced writing while aspiring in other areas. Such as, I am getting my PhD in Psychology currently as as a law degree. I am a wedding planner and have a full resume of other accomplishments but without writing, I’m not me. Do you have pets, and if so, what kind? Oh yes. I have an adorable Pomeranian named Tigger. He travels everywhere with us. You can catch Shaunna on Amazon.com, and on Smashwords.com. This entry was posted in Friends, Great Reads & Author Interviews, Of Interest and tagged Country Heels, Great Fiction, Shaunna Rodriguez. Bookmark the permalink. Jules this is wonderful. So many authors need the exposure. Thanks for sharing the authors that you are discovering and letting us get to know them a bit better.